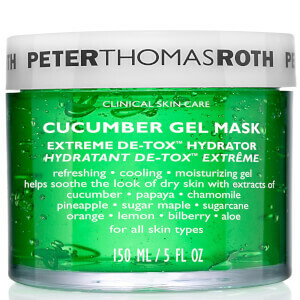 Awaken tired eyes with the Cucumber Hydra-Gel Eye Masks from Peter Thomas Roth. Energising and refreshing, the eye contour gel patches work to visibly reduce puffiness, dark circles and fine lines. Enriched with cooling Cucumber extract, the masks naturally detoxify and hydrate the delicate skin at the eye contour, whilst a skin-loving blend of Allantoin, Chamomile and Aloe works to visibly calm the skin’s appearance. Hyaluronic Acid, Niacinamide and Hydrolyzed Collagen work in synergy to deliver a veil of hydration to the eyes. The moisture visibly plumps the skin and helps to reduce the appearance of fine lines and wrinkles, including stubborn crow’s feet. After sitting on skin for 10-15 minutes, the gel patches leave the eye area visibly bright with a youthful and revitalised finish. Use enclosed spatula to gently lift and separate a delicate gel patch. Apply onto clean, dry under-eye area. Repeat on other side. Relax and enjoy for 10-15 minutes. 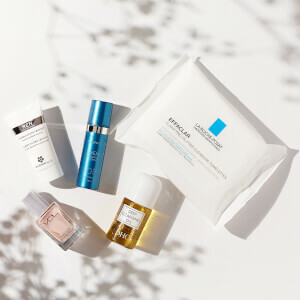 Discard after use and gently pat remaining serum into skin. For external use only. Water/Aqua/Eau, Glycerin, Carrageenan, Dipropylene Glycol, Ceratonia Siliqua (Carob) Gum, Cucumis Sativus (Cucumber) Fruit Extract, Aloe Barbadensis Leaf Juice Powder, Caffeine, Arnica Montana Flower Extract, Sodium Hyaluronate, Hydrolyzed Collagen, Chamomilla Recutita (Matricaria) Flower Extract, Camellia Sinensis Leaf Extract, Tocopheryl Acetate, Niacinamide, Adenosine, Allantoin, Maltodextrin, Ethylhexylglycerin, Butylene Glycol, Calcium Lactate, Ricinus Communis (Castor) Seed Oil, Xanthan Gum, Dextrin, Potassium Chloride, Disodium Edta, Peg-60 Hydrogenated Castor Oil, Chlorphenesin, Phenoxyethanol, Mica, Fragrance/Parfum, Yellow 5 (Ci 19140), Blue 1 (Ci 42090).